The Downbeat Club, or Club Downbeat, was near the 700 Club at the corner of South Rampart and Girod. 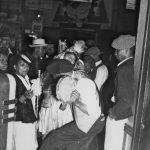 In The Soul of New Orleans: A Legacy of Rhythm and Blues, author Jeff Hannusch reports that the Downbeat’s owner used the club as a front for prostitution and bootleg whiskey operations. 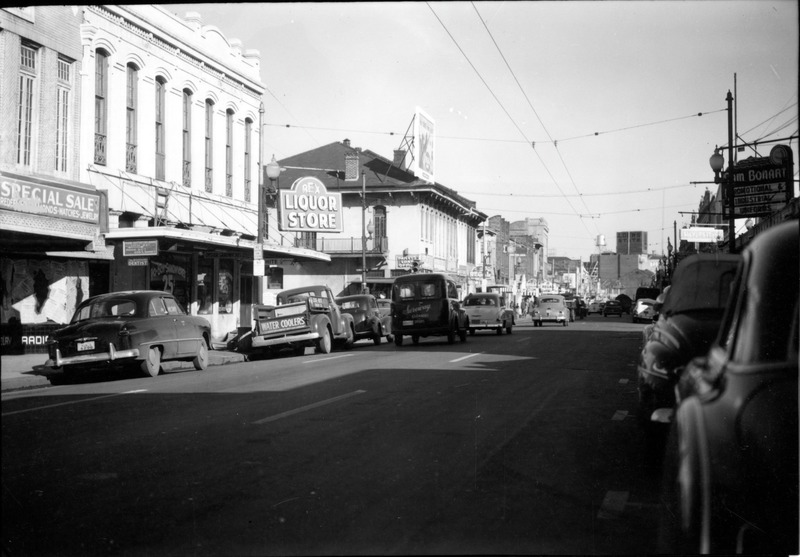 The blues shouter Clarence Samuels took a regular gig here in the late 1940s to attract some legitimate business. In 1947, Samuels teamed up with Roy Brown — a young singer born in New Orleans who’d been bouncing around Texas. They billed themselves as The Blues Twins, trading sets in front of Edgar Blanchard’s band. They proved to be a draw, and when Brown’s record “Good Rockin’ Tonight” came out, the crowds went wild. 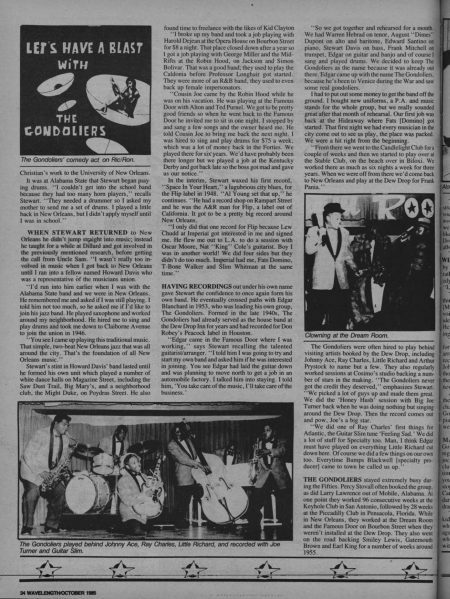 “Good Rockin’ Tonight,” with Brown’s gospel-inflected vocals, was a seminal rhythm and blues song and the hottest record in black New Orleans that summer. Brown couldn’t get enough of it himself: when he first heard it, he kept feeding change into the jukebox to play it over and over. His take at the Downbeat went up to ten dollars a night, but other venues offered him even more. When the record caught on nationally, Brown hit the road to promote it, packing houses across the country. His delivery and suggestive lyrics (“I’m gonna hold my baby as long as I can”) had a mass appeal. The song helped establish the term “rock” in mainstream speech. Brown became a star, cutting more hit records and blazing a trail for R&B’s mainstream success. “Good Rockin’ Tonight” was covered by Wynonie Harris, Elvis Presley, and countless others. Meanwhile, Brown’s manager and record company were pocketing earnings that should have gone to him—sadly not an uncommon story in that era. Elvis, who’d profited from his 1954 version of Brown’s signature tune, wound up helping Brown pay a debt to the IRS. 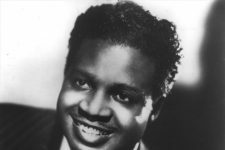 At the Downbeat, Brown’s success in 1948 didn’t do anything for Clarence Samuels. Fortunately, a talent scout for the Chess brothers in Chicago spotted him at the club and brought him north. 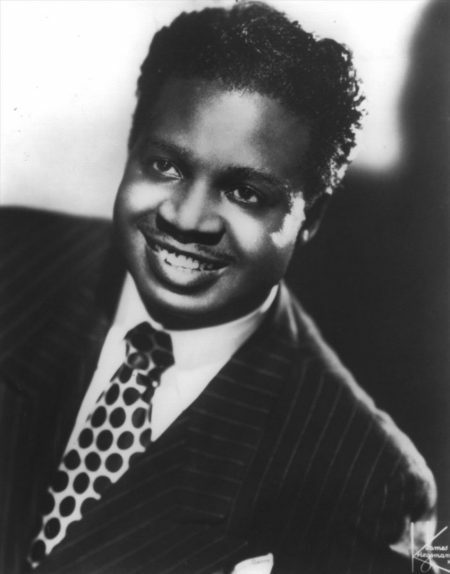 Samuels went on to tour and record nationally throughout the 1950s. Joe August, known as Mr. Google Eyes or Mr. G, sang opposite Brown at the Downbeat, too. 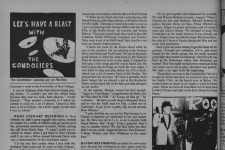 He was only fifteen at the time, and billed as “the nation’s youngest blues singer.” His nickname came from his tendency to ogle female diners at Dooky Chase restaurant where he worked. August made himself welcome at clubs around town by saving up $109 to buy a public address system–most bands didn’t have one, so he lent his out in exchange for time on the bandstand. Nearly all of New Orleans’ R&B artists who came later and enjoyed more commercial success than Mr. G cite him as an influence. 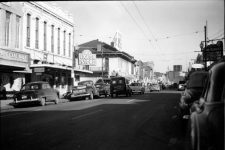 South Rampart Street in 1949, not far from the Downbeat Club. Courtesy of The Charles L. Franck Studio Collection at The Historic New Orleans Collection, 1979.325.5499	Photo by Charles L. Franck Photographers. From 1985 in Wavelength, a look at Edgar Blanchard's Gondoliers (bottom). Blanchard, a ace guitarist and arranger, backed Roy Brown and Clarence Samuels at the Downbeat Club. From Wavelength magazine, October 1985.